The long awaited second release from Hecate’s Wheel. 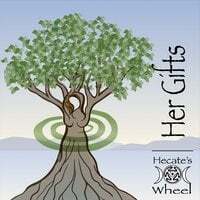 Her Gifts - An insightful assortment of songs from the Goddess, mother earth, love and life beautifully crafted by the outstanding vocal harmonies of Hecate’s Wheel. We like to sing. Singing makes us happy! Described as the "ultimate in Girl Power Pagan music", Hecate’s Wheel enchants and inspires Witches and Muggles alike. The ladies deliver outstanding vocal harmonies while telling tales of the Goddess, love, and life. Hecate’s Wheel is Vicki Scotti, and LuAnn Morris. The women have been singing together in the Tampa Bay area for many years. The addition of Astarte Moondancer complements their melodies with her interpretive style of sacred dance. Hecate’s Wheel is recording their second CD currently scheduled for release Lammas 2015. Hecate’s Wheel is inspired by and dedicated to the Goddess, their source of inspiration for the music they write and the songs they sing!